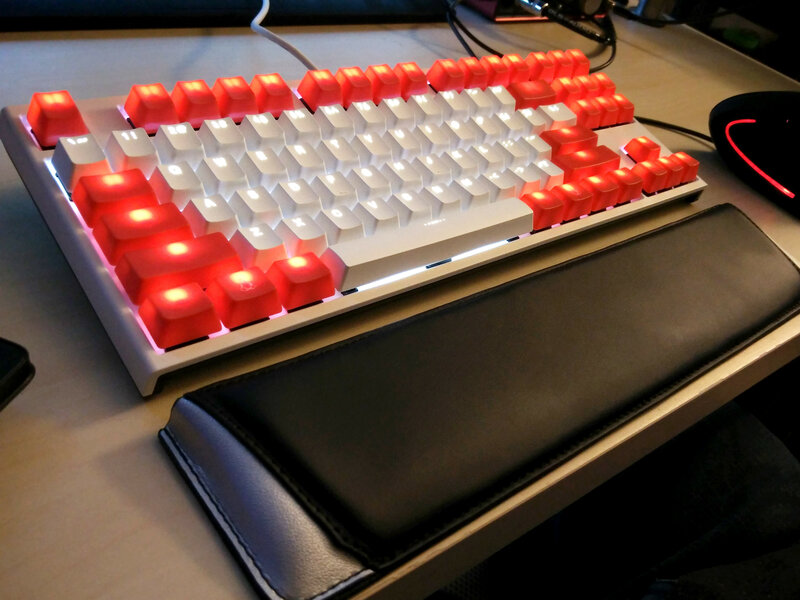 This is a follow-up to last week's post on looking for a new mechanical keyboard to facilitate my code and writing activities. Ladies and gents, I have settled on a keyboard! This guy shipped with the Cherry MX Red switches that I determined previously were the best suited to my needs of being easy to type with and have no tactile bump as the key travels. This turned out to be a great purchase, as it is a great fit for my typing. 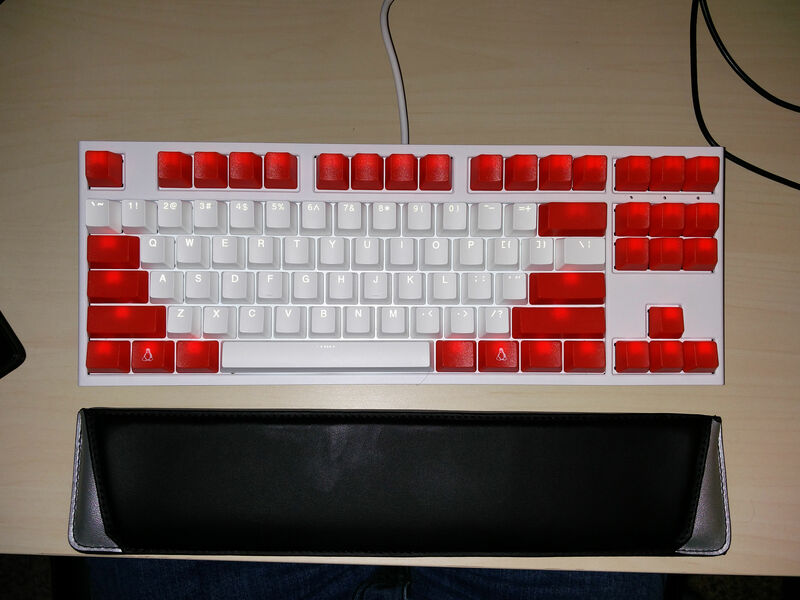 On receiving the keyboard along with the blank red WASDKeyboards modifier keycap set, the modifier keys were all swapped out in favour of the red ones to get this nice colour palette. The only thing I am not a fan of is that the Ducky One 2 ships with high quality keycaps, and WASDKeyboards only makes custom keycaps of lesser quality, which shows when you look closely between the two types when installed. However, I knew this going in. The main concern for me was the colour, and they delivered in that regard. 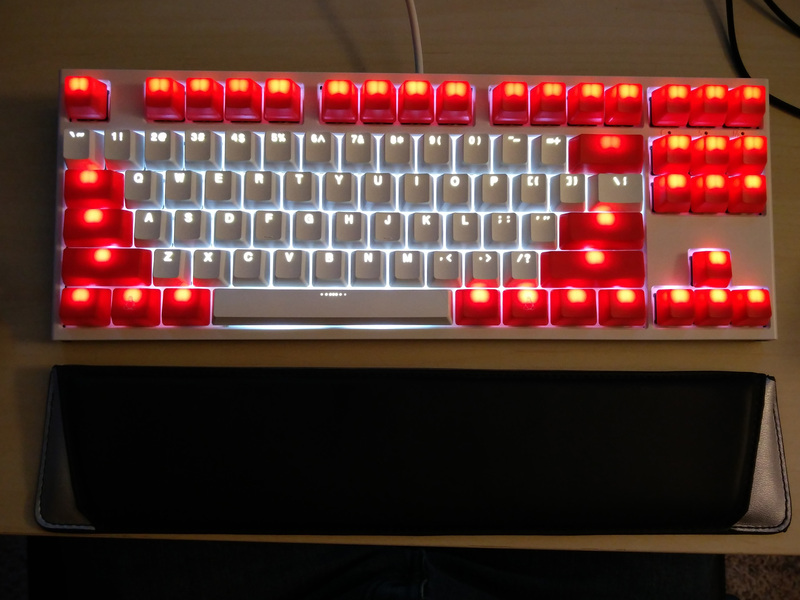 The backlighting lights the red keys really well, which turned out to be a neat feature and made me glad I went with the blank keys since the white printing on the red keys probably wouldn't have looked as clean as these. I cannot stand the sounds of keyboards no matter what switch you put in them. To Ducky's credit, this keyboard is built such that bottoming-out the key does not produce a loud hollow sound like I'm used to with the Rosewill Apollo. It's a less-loud sound, like tapping on a solid block of wood versus tapping on a hollow one. This makes it really nice for me to type fast since I'm less concerned about how much noise I'm making, as typing fast on any other keyboard of mine becomes disruptive quickly. Unexpected feature: the Ducky One 2 with the white backlights comes with numerous lighting modes where you can get it to flash all kinds of different patterns, have reactive lighting to your typing, and have the fade-in-fade-out wave behaviour as well. Clearly none of these are necessary for me as they're just flashy for the sake of being flashy, but they're real nice to play with. More important to me was the ability to set the brightness, or turn off, the backlights, since I found that having the keyboard at 100% brightness was actually painful to look at. In the photo I've set the brightness close to 50%. Thus far my experience with Ducky is a positive one.